After my last post, my sister who was initially reluctant for me to take a dive into the blogging world requested that my next post be about one of our all time favourites – Strong Girl Bong-Soon (super power girl)!! 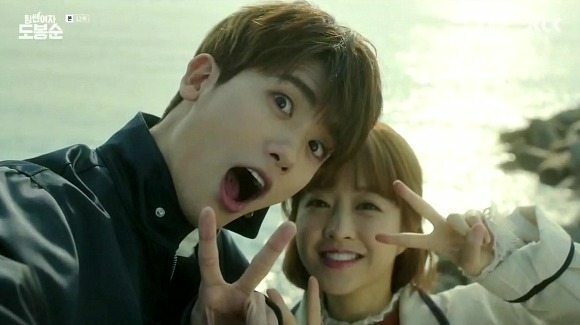 Notwithstanding the various surrounding criminal activity, the primary narrative arc is the love story between Bong-Soon and Min-Hyuk. They have to be one of my all-time favourite k-drama couples. I usually have the k-drama problem of getting my heart broken because I support the secondary couple (that is the lead lady and the second leading man, who eventually has to suffer the pain of an unrequited love). No such problems here. This show left my heart in tact as the chemistry between Bong-Soon and Min-Hyuk was very convincing and I could whole-heartedly understand/support their love and fondness for each another (how many times have I used ‘heart’ in this paragraph?). This drama also has fantastic supporting characters (particularly Bong-Soon’s family), however there were a few sub-plots which didn’t really go anywhere and could be entirely missed without losing any part of the main story (I am specifically referring to Baek Tak and his gang’s narrative). Min-Hyuk begins to develop feelings for Bong-Soon in this episode and Bong Soon starts consciously and purposefully using her strength. Could this be the beginning of her super power days? The opening scene in this episode confirmed to me that this was indeed a k-drama that needed to be binged watched…although this episode didn’t add a lot to the story, I really enjoyed watching the love triangle between Bong-Soon, Min-Hyuk and Guk-doo. Min-Hyuk falls head over heels for Bong-Soon in this episode! Although this was the ‘saddest’ episode for me it still had funny and very tender moments which made it very re-watchable. … and also that Bong-Soon starts to see Min-Hyuk in a new light! Although I have only listed 5 episodes (and a bonus), this drama is littered with adorable moments. If you haven’t seen it, it is definitely worth watching in its entirety. If you have seen it, it is still worth watching in its entirety all over again (minus the Baek Tak moments). Strong Girl Bong-Soon is available on Netflix and Viki (RIP Dramafever).